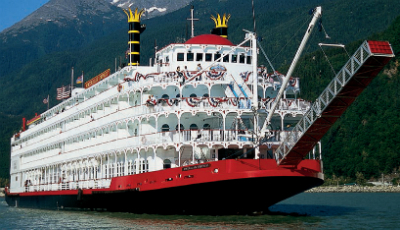 The American Empress maintains a balance of yesterday’s historic charm and today’s modern comforts. Easy-going yet elegant, the 237-guest sternwheeler offers all outside staterooms with large river view windows and modern conveniences like a refrigerator, mini-bar, individual thermostat, CD-player and television. The spacious bathroom includes a shower, hair dryer, clothesline and vanity with abundant storage space. With the American Empress serving as a floating boutique hotel for your journey between Portland, Oregon and Clarkston, Washington, you will trace the footsteps of Lewis and Clark surrounded by all the comforts of modern luxury. The soaring mountains, dramatic landscapes, abundant wildlife, and frontier spirit of the fascinating West are the perfect complements to the cultural history, quiet towns, and genteel character of voyages on the Mississippi, Ohio, Tennessee and Cumberland Rivers. Just as the American Queen embodies the Heartland and the legacy of Mark Twain, the American Empress was designed specifically to celebrate the rich tradition of exploration in the West.